This is an attempt to index references to The Bronx in "The Archdiocese of New York: the Bicentennial History," a marvelous 624-page book written by Thomas J. Shelley. The 2007 book may still be available on Amazon or other book dealers. Use the alphabetic list of labels to the right or the search box at top left. The blog format places new posts at the top, but I also edit old posts with new photos from my travels around The Bronx. See pages 484 and 485 for the 1921 foundation of Holy Cross parish on Soundview Avenue, Clason Point. The parish website is linked here. The rectory address is 600 Soundview Ave., Bronx NY 10473, telephone 718-893-5550. 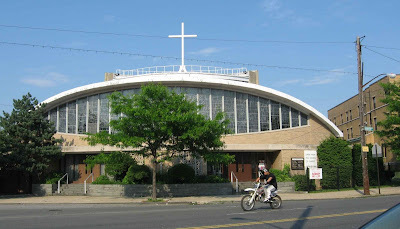 Above is the church, on the east side of Soundview Avenue. The intersection is Taylor Avenue is to the left. The church was designed by Brother Cajetan Baumann, O.F.M. A year or so ago, archdiocesan clergy replaced the Franciscan Friars, who for more than eighty years staffed this parish. An interesting set of historical photos is linked here. I note that for a while this parish had a combined church-and-school structure that several Bronx parishes built in the 1920's. Above is one of the parish school buildings, located on the east side side of Thieriot Avenue just north of Randall Avenue. Another building which appears to be a school with a playground is one the west side of Thieriot Avenue, that is, somewhat behind the church. 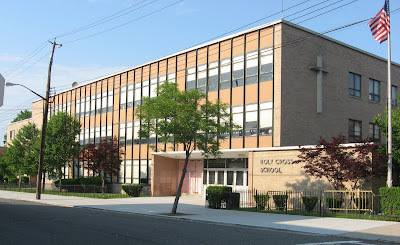 The address of Holy Cross school is 1846 Randall Ave., Bronx NY 10473. The school website is linked here. Warning! School enrollment figures may be stale or otherwise inaccurate. It is difficult to find grade-by-grade numbers given with the date of the count.